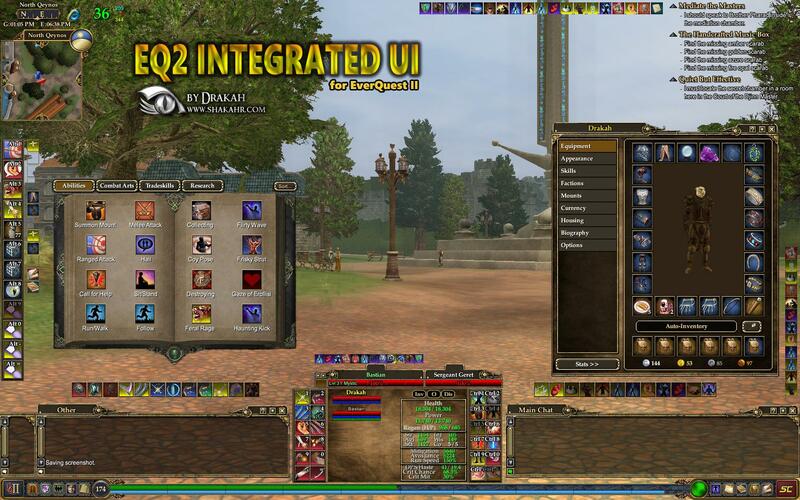 This UI simulates the UI I created for EQ1 and was made for a resolution of 1680 x 1050. If you are not using the same resolution, then you will need to adjust the windows accordingly, hopefully to a similar setup I have via the screenshot. Some windows may be hard to move, but it is possible. If you cannot move the window, make sure the window is Unlocked. as well as the Click-threw option would pose a problem to move things. Read the Readme text file for installation instructions. Just started using your UI and I love it. I'm using 1920x1050 which gives me the opportunity to add even more buttons! More buttons = more joy Now for the BUT...EQ2 MAP installs and loads correctly. But, it seems you play with different settings, thus, I can't get it to work properly. Could you please let me know which settings need to be changed to sort this issue out. Thank you. Gorgeous UI, any plans on doing anything with the raid window? hi i downloaded your UI and really like it but i am playing a necro and cannot find the pet action bar to choose passive.attack,ect. and i also cannot find a permanent pet health bar only one that appears as the pet is attacking. not sure if i am missing something or if this UI does not support pet classes. There is no Pet Window customized, so its using the default for that. Perhaps you have the pet window offscreen or a keystroke to open/close the window?